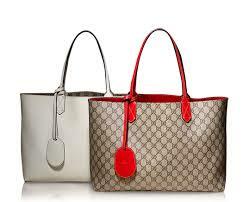 Gucci bags are among the most highly demanded bags all over the world. They come in different shapes and sizes, and though they’re quite expensive, they’re of a very good quality. However, there are also a lot of fakes out there and it’s important that you’re able to spot them out on your own. Here are some simple tips that can save you from buying fakes for the same price as the real deal. Every new Gucci handbag comes along with a ‘controllato’ card. This card signifies that the bag was tested and checked properly after it was made. This card has the word GUCCI printed on top and the centre of the card is printed ‘controllato’ (all in small letters) beneath it is followed by the set of numbers 1234567890. Every modern Gucci handbag is meant to feature a label inside with a registered trademark circled R, with the ‘Gucci’ brand name in the center and on the bottom, ‘Made in Italy’. Make sure you properly examine this label. Check for spelling mistakes, spacing, positioning of the logo and also the font. Some vintage Gucci handbags might differ from these specifications. To find the serial number of your Gucci bag, you’ll have to check the interior. Over the years, the pattern of the serial number has changed, but one of the most common is with two set of numbers one above the other. One of the easiest way to spot a fake item is by the stitching. Check the stitching and follow it carefully. It must be neat, even and simply perfect. Most of the fake bags try as much as they can to clone the stitches from an original Gucci bag, but there’s always a mistake somewhere. So just make sure to follow the thread used carefully. Every Gucci bag is always accompanied by an information booklet. Carefully check to see if you’ll find any error in the spellings or the font or in the spacing and positioning of the logo. Every Gucci bag of our generation is meant to have a code on the interior. This tag has a QR (Quick Response) code on it. Vintage types of Gucci bag might not have this tag. There’s always this high quality dust bag that comes along with a modern Gucci bag. It’s important that you observe this bag to look for any funny or silly mistakes. Over the years, there have been variations in style and color. But all the different variations have either the word GUCCI written on it or have the GG logo’s repeated on it. Make sure to check the font, spacing and positioning of the logo. You probably won’t find it funny if you spent a substantial amount of money on getting a Gucci handbag, only to be told that the bag isn’t authentic. So take the time to pay close attentions to all these little details.